Book 41 in J.D. 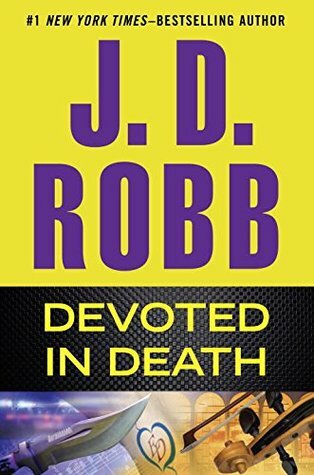 Robb’s (AKA Nora Roberts) In Death series is more police procedural than mystery or who-dun-it. We get to meet the villain right from the start and then the rest of the story tracks how Eve her husband Roarke, and the rest of the team solve the case and catch the killers. I can’t imagine how hard it must be to keep things fresh 41 books into the series, but die-hard fans like me are likely to find this one kind of cozy. As opposed to Obsession in Death, Beloved characters aren’t really threatened, there isn’t a mystery for the readers since we already know the who and the where, we are just along for the ride to find out how. So yeah, despite horrific deaths etc, this one is cozy. We spend time with most all our favorite characters and see them interacting. This particular story added some interest though with the inclusion of a new temporary character, a southern cop who was a nice bit of enjoyment. I wouldn’t mind him popping in again. And Robb just continues to push, or let DeWinters try to push herself into the group, so we have what looks like a new permanent addition. We also had the (relatively) happy situation of having victims that can be saved, which is something i always enjoy and which lends a bit more urgency to the story for me. We also had some fun with Eve being temporarily banned from coffee and a new marriage rule. It is another solid entry for die-hard fans, but I can see where the bloom might be off the rose for some people. For myself, I am perfectly content to keep dipping into Eve and the gang’s lives. But I do sometimes wonder, am I content still because I am a re-reader? Would a person who isn’t a re-reader be more likely to be disaffected by this point in the series?